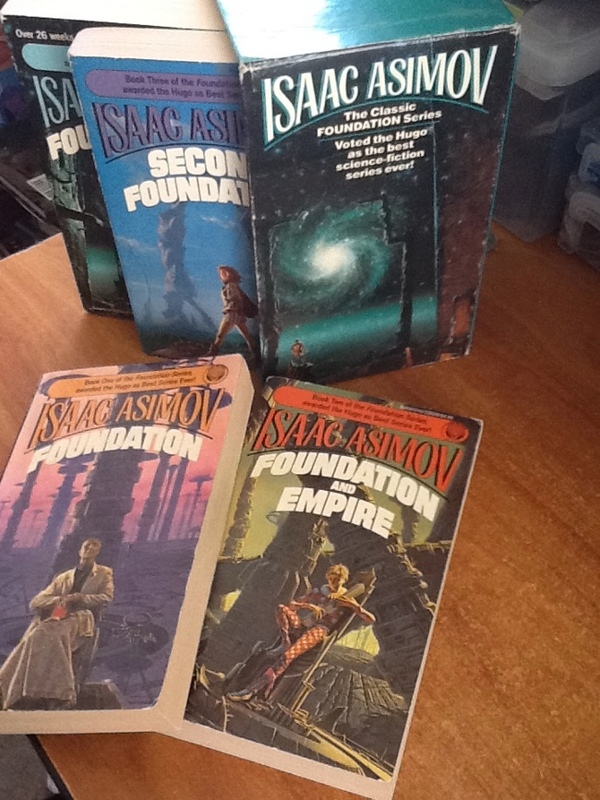 For me, that moment was my twelfth Christmas, when my mom bought me the Foundation Trilogy box set. I hadn’t yet read any Asimov when I unwrapped that gift, but the colorful, evocative Michael Whelan covers fascinated me instantly. I remember ignoring most of my other gifts and disappearing into the spare bedroom. My grandparents kept that room closed off and unheated year-round, so it was freezing, but I didn’t care. I curled up on the garish purple bedspread, surrounded by my grandmother’s collection of creepy dolls covered in protective plastic, and started plowing my way through the Foundation books. It took me days to get through them all, of course, but when I finally finished Foundation’s Edge, returning to my own life seemed foreign and almost bland. I lost myself completely in the story, the way only a kid can. I’d love to say that reading Lord of the Rings provided a similar experience, but it didn’t — as a youth, I found Tolkien hard to get through, and only began to appreciate his work later in life. (As a kid, I skipped over everything but Gollum and the end, and didn’t get through The Scouring of the Shire until I was about twenty-five.) I did, however, listen to the Mind’s Eye Theater adaptation of Lord of the Rings on cassette a hundred times or more, and to this day will get very cranky when people lambast its shoddy production values in favor of its presumptuous, snooty cousin, the BBC Radio adaptation. All in all, though, I can probably count those experiences on the fingers of one hand — the aforementioned trilogies, a handful of Stephen King novels, and a random assortment of fantasy and sci-fi books that I can still pick up today and read straight through without ever putting them down. I still bear a love for the paperback boxed set that borders on the fetishistic — I’ll buy a series just because it comes in a box. The boxed set has gone into full remission these days, mostly replaced by the omnibus, and I miss it dearly. As life marches on, obligations swell while free time seems to wither, and youthful enthusiasm sometimes gives way to jadedness or cynicism masquerading as wisdom. It becomes harder and harder to get caught up in a good story and ignore the world until it’s over. The lengthy book gives way to the movie or the half-hour sitcom, story delivered up in inoffensive bites, the Wonder Bread of narrative. That’s how it often is with me, anyway. I find reading every day now takes conscious effort in an age of easy, shiny distractions. Of course, if you’re a writer, there’s a whole other peril to wade through — learn enough about craft and it’s easy to start analyzing every story you read, breaking it down into its component parts, clinically examining its merits and flaws, dissecting rather than digesting. Those childhood blinders are awfully hard to get back on once you’ve taken them off, and flipping the “critic switch” can seem downright irresponsible. Some people rediscovered that joy with the Harry Potter books. I didn’t — but I do sometimes envy those who could. I often think that the greatest gift I could get these days would be providing that sense of immersion to another reader. If I could, just once, sweep someone away with a story, make them neglect their chores, snub their spouses, maybe even refuse to get out of bed all day, because they just had to find out what happened — well, that would probably be the best Christmas ever. Do you have a reading memory that’s stayed with you like this? If so, please feel free to drop me a comment and tell me about it. I had that experience with both the Robot novels & the Foundation series, as well as the original Dune series. I think the first couple of books of the Amber series (Zelazny) and the first few books of Discworld probably approached it as well. As a kid I could lose myself in the Chronicles of Narnia over and over until the day I realized what was going on. Oh, and the first time I read 100 Years of Solitude I got completely sucked in. I can still *hear* the way the ending rushed like a storm in my head. I know what you mean about chasing that experience. I still do, but I haven’t found a new book that does it for me in ages. I have to go back and read Dune periodically. I’ve been thinking of picking up the Robot novels & Foundation, but part of me worries they won’t resonate the way they did and I don’t want to tarnish that memory. I know what you mean about not wanting to revisit old favorites. I’ve left Dragonlance alone for that express purpose. My dumb adolescent self loved those books, why take that away from him? And re-reading Dune had a much different effect on me the second time around. I’m glad I still love Dune the way I always did. 🙂 Having read all of the books (except the kid & the other guy might have made another one), my brain just relaxes into that world really easily. Everything outside the original series is pretty crappy, but it does make the picture bigger and more detailed. I still really like Dune. I love Dune Messiah. Children of Dune just kind of lost me. I was still pretty dedicated to the world when I read those, and then I got sucked back in with the books that focus on the Bene Gesserit.